The Lower Howard's Creek Valley is incised into the uplands on the north side of the Kentucky River. The valley is an island of ecological diversity and a museum for remnants of pioneer industry surrounded by an intensively managed agricultural landscape. Lower Howard's Creek is notable for its cultural landscape and its ecological diversity. The process emphasized clear analysis to develop a management plan capable of guiding many years of implementation. The valley is a complex landscape with hundreds of notable features which makes it difficult to comprehend in its entirety. 20 districts were identified; each had a sense of landscape unity and was centered on a significant cultural landscape complex or natural condition. 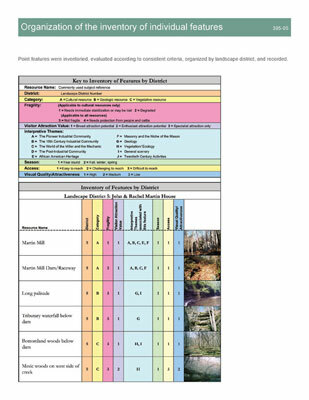 In each landscape district, individual features were inventoried and cataloged with an assessment of eight different characteristics. Rankings for these characteristics were carried forward into analysis of interpretive opportunities, cultural resource treatments, and biological resources protection. 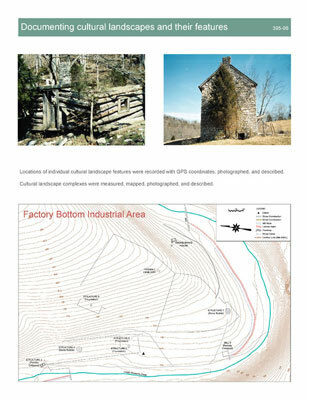 The project team documented cultural landscape features and complexes with measured plans, photographs, and condition assessments. The landscape distribution of natural features was mapped based on field inventory and aerial reconnaissance. 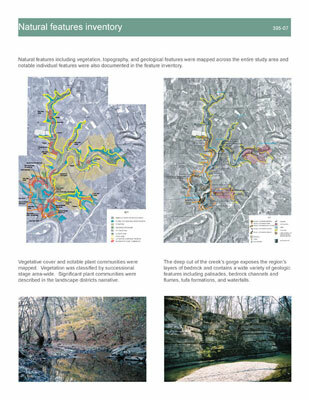 Threats to both biological and cultural features were described in detail for each district and summarized on this map for the entire study area. "Incredibly moving in preserving cultural legacy and demonstrating the majesty of things from the past. A very clear action plan." 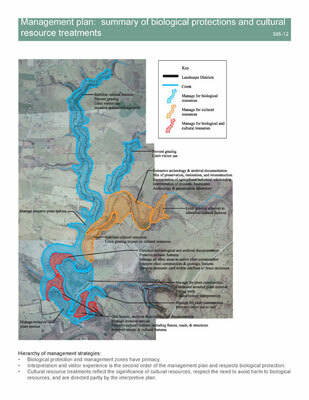 The Lower Howard’s Creek Corridor Management Plan is the first comprehensive management plan of its type in the region. Careful planning and analysis was needed, not to construct new features, but to determine how this important landscape should be protected. 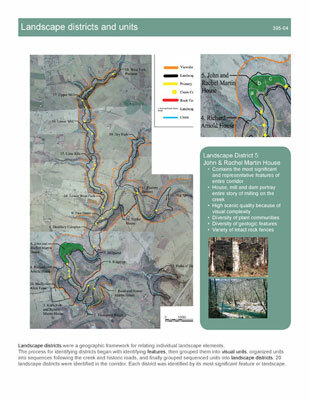 This project uncovered the multi-layered stories of the Lower Howard’s Creek landscape, and developed protection and interpretive strategies to allow the landscape to continue to depict those well stories into the future. 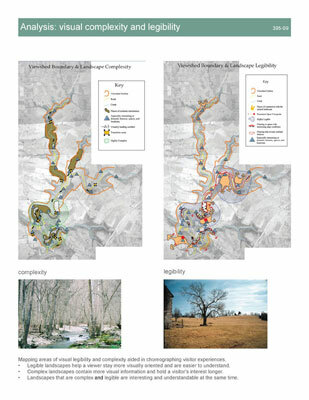 A Great Challenge in landscape planning and analysis is to maintain an empathetic connection to landscape, while conducting a defensible analysis that supports logical decision making. 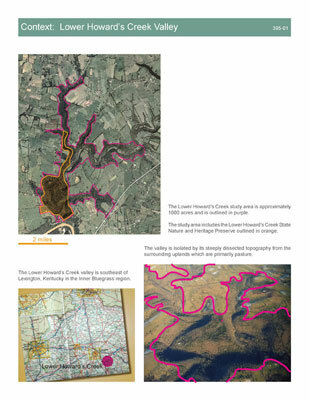 The consultants and clients for the Lower Howard’s Creek Corridor Management Plan met that challenge by combining a narrative description of cognitive landscape districts with thorough documentation of cultural and natural resources, and explicit methods for evaluating resource significance to make planning decisions. The plan and accompanying report communicate effectively with a lay audience of citizens, property owners, and local public officials, and make a defensible case for funding to state and federal environmental agencies. The Lower Howard’s Creek Valley is located at the edge of the Inner Bluegrass Region of Kentucky. The creek itself is a short stream and cuts a deep gorge from the Bluegrass uplands to the Kentucky River. The valley is part of an ecological sub-region within the Inner Bluegrass known as the Kentucky River Palisades and Tributary Gorges. The palisades landscape is the major remnant of native forest in the Inner Bluegrass and the varied topographic forms of the Lower Howard’s Creek valley support a diverse group of plant communities that include several endangered or threatened species. This is in sharp contrast with the rest of the region, which is intensively managed for livestock agriculture. Lower Howard’s Creek played a significant role in the early settlement of the trans-Allegheny frontier. Across the Kentucky River from the Boonesborough settlement, it was the first creek populated by millers harnessing water power when they moved out of Boonesborough’s fortifications. The valley is also emblematic of African-American experience in Central Kentucky. Enslaved Africans built and worked in many of the valley’s industrial and agricultural enterprises. Freed families remained after emancipation, first as employees of landowners and later as subsistence farmers who supported themselves with employment outside the valley. The community of freed men and women centered around the Old Stone Church, formerly the home of a white congregation in which Daniel and Rebecca Boone’s children were baptized. By the late twentieth century, the valley was mostly unoccupied as residents abandoned Lower Howard’s Creek for employment opportunities elsewhere. The valley today is mostly covered in early and mid-succession woodlands. Palisades, waterfalls, sinkholes, and other geologic formations are dramatic evidence of erosion as a sculptor of topography. Cultural features include at least six mill complexes, abandoned but intact stone houses, the stone church, the ruins of a distillery and other industrial enterprises, numerous house ruins, rock quarries, and an extensive network of pioneer roads and rock fences. Part of the valley is protected as the Lower Howard’s Creek State Nature Preserve, but most land remains in private ownership. To design a conceptual plan for visitor access and interpretation, emphasizing a vision for future experience and linked to biological protection and cultural resource preservation. The Inventory was significant for the depth of understanding developed and communicated in the plan. Archeological survey, historic documentation, natural features inventory, and visual character assessment were individually engaged, but also described holistically in a landscape narrative. 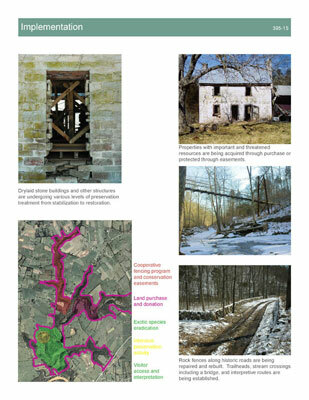 The narrative linking these resource types together describes a cognitive system for comprehending the complexity of the resource-rich Lower Howard’s Creek Valley by shaping a mental geography of 20 landscape districts. Each district is centered around a predominant cultural or natural resource complex. Each district is further described as composed of one or more landscape units, each having a clear spatial identity. Archeological features and their sites were located precisely by GPS coordinates, photographed, measured, described, and assessed for condition in the field. Historic documentary research using primary and secondary sources was used to link sites to people, times, economic patterns, and folkways, leading to later development of interpretive themes and evaluation of significance. Biological resource documentation benefited from existing studies, including those conducted by the Kentucky State Nature Preserves Commission and Joe Kendall Neel’s fascinating 1938 thesis from the University of Kentucky Biology Department. Parallel work to inventory all vascular plant species in the publicly owned portion of the valley was underway at the time of the project. A macro-scale plant community inventory was conducted by the consultants based on reconnaissance from a small plane and the ground. Geological features were inventoried with emphasis on visual prominence and ability to explain regional geologic characteristics. Visual character was documented and assessed using a descriptive system modified from Steven and Rachel Kaplan’s theoretical work Cognition and Environment: Functioning in an Uncertain World. This method emphasized visual legibility and complexity, which related well to the geographic division of the valley into connected landscape districts and units. Land use conditions and potential conflicts with resource conservation were surveyed and documented with emphasis on farming practices and scattered rural residential development on adjacent uplands. Terrain presented extreme access challenges in a narrow valley landscape whose roads were last used before automobiles existed and where the main wagon road crossed the creek 14 times in three miles. 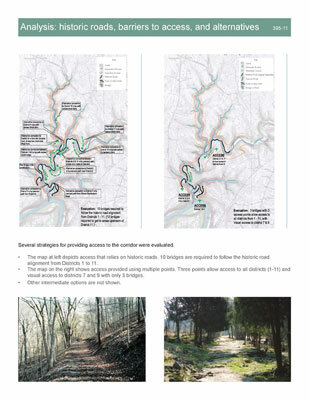 Slope conditions were mapped, historic stream crossings and potential alternates evaluated, and alternate overland routes were explored to provide information for the design of access routes for visitors and for equipment needed for structure preservation. The project’s approach to data gathering was based on careful observation, an ethic of stewardship, and a sense of landscape not as abstract areas, but as the spatial expression of natural and cultural history. The involvement of the landscape architects in the field work led directly to the design of meaningful visitor experiences and to the protection of smaller scale individual features unlikely to be understood in a broad-scale, categorical landscape inventory and analysis. Involvement of Interested Parties occurred throughout the project to inform the process about the landscape, and cultural and natural features of the valley. Involvement went well beyond the traditional large public presentation format. Local residents led team members on tours, shared the folklore of the valley, and described features and locations that were most important to them. Small group meetings with individual landowners were found to be productive because future plans for ownership changes, conservation easements, and other property issues could be discussed more openly than in a public forum. 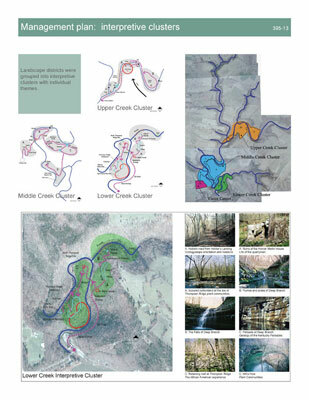 The Friends of Lower Howard’s Creek, which represented the community and the county government as client, was actively and critically engaged in the development and review of the plan for the valley. Reporting to the community as a whole has extended beyond the planning and design phase as members of the design team and stakeholders have delivered public talks at the local library and museum to keep the valley in the public eye. Analysis A readable explanation of the inventory was linked with a rigorously explicit analysis process that considered cultural resource preservation, biological protection, and the ability of resources and districts to communicate interpretive themes. Threats to biological and cultural resources were assessed early, based on a combination of the fragility of the resource and the intensity of the threat. Farming and grazing practices, erosion, invasive plant species, and the potential for damage by future visitors were all incorporated into the threats assessment. Interpretive themes were developed as part of the inventory and were based on the cultural and economic themes revealed by historic documentation and on an understanding of the biological, geological, and visual resources and their relationship to regional geography. 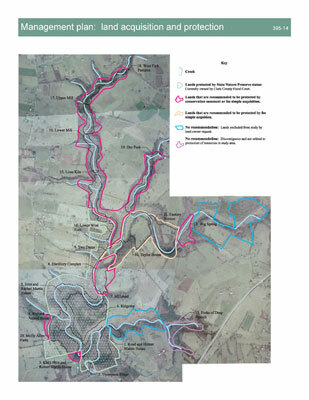 An access and barriers analysis evaluated different schemes for providing trail and work vehicle access to the valley. In each scheme, the ability to ford the creek at 14 different points and the potential expense and intrusiveness of bridges were balanced against the potential for trails on valley slopes, and the interpretive importance of using the old rock fence-lined roads that traversed the valley through homesteads, industrial sites, and quarries. Visual analysis ranked districts according to the density and balance of features that contribute to both visual complexity and visual legibility. This ranking was based on a rationale that in districts where visitors would be simultaneously most intrigued and most oriented, they could develop a more vivid understanding of the landscape’s cultural history and ecological dynamic. The Design Proposal focused on weaving visitors through the valley and into the very most intriguing places, while teaching them about its natural and cultural history. This experience was designed to avoid impact to biological resources and it influenced choices about which cultural resources would be merely stabilized and which would receive more intensive preservation action. The intent, after all, was to design an experience within a place that already has its own genius and to only minimally change that place. 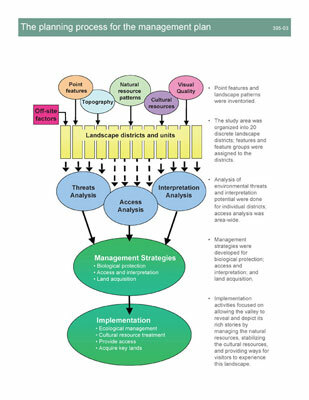 Biological resource protection strategies included monitoring listed species and unusual plant communities, protection of additional areas from grazing, differentiating appropriate levels of visitor use in different parts of the valley, eradication of invasive exotic species, and selective management of certain areas as cultural landscapes. Four interpretive experience clusters were designed, each with an emphasis on a different aspect of the valley landscape and each intended to occupy a half-day’s time. The clusters were made up of landscape districts that when grouped together could most clearly communicate a group of interpretive themes and that could be linked with a coherent sequence of paths, usually on historic roads. Management regimes in each cluster include natural succession, maintenance of domestic yard clearings, active preservation of cultural resources, and other strategies. Each cluster includes one district where a cultural feature can serve to concentrate and focus interpretation around a physical structure: a new visitor center in one cluster, preserved stone houses in two others, and the preserved archeological remains of a settlement in the fourth cluster. 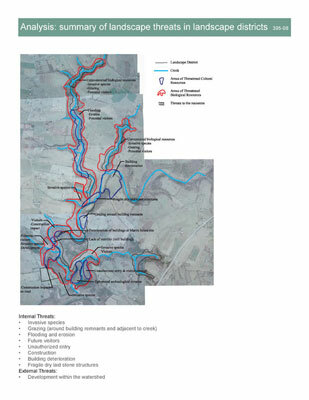 Cultural resource intervention is perhaps the most costly effort associated with the corridor management plan, and it has been phased over many years according to priorities ordered by the immediate need to stabilize a feature, the interpretive role of a feature, and the appropriateness of a particular intervention within the environmental context of a landscape unit and district. Land protection and acquisition objectives, wider scale land use and watershed planning, and future resource documentation are all prioritized within the plan so that local advocates and governmental bodies have clear directions for action over a long period of time and are not left to sort out a sequence of appropriate actions. Implementation of all aspects of the plan will take decades. Significant steps have already ingrained the plan into the landscape. An active volunteer invasive species removal program is in place. One large property has been purchased and incorporated into the existing State Nature Preserve. Rock fences have been rebuilt along historic roads. A suspension foot bridge was built over a key creek crossing. Trails connecting historic roadbeds have been marked and cleared. A key stone house has been stabilized and documented, and is now undergoing a more intensive preservation treatment. Public funding is being used to fence cattle out of fragile areas on public and private property with the cooperation of landowners. 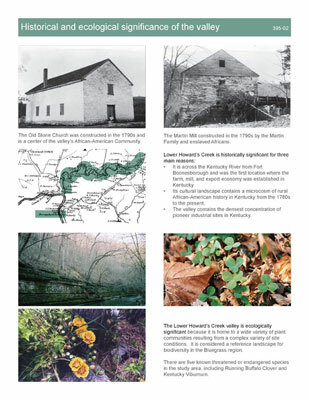 Monitoring of the valley and its resources is an ongoing activity of the Kentucky State Nature Preserves Commission, Clark County government and the Friends of Lower Howard’s Creek, a non-profit advocacy group. All three groups have an active interest in the valley and its well-being. Additionally, researchers from Eastern Kentucky University and the University of Kentucky continue to monitor the ecological resources in the valley. In summary, possibly the most important aspect of this plan is that a diverse set of interests have found common ground in a well-expressed vision for the future of the valley. The vision has the flexibility to accommodate future directions, while being based on sound analysis and a thoughtful sense of the wholeness of landscape. Visual assessment was summarized in two maps: one illustrated landscape legibility or the ability to make visual sense of the valley, and the other illustrated landscape complexity, or the contrast, variety, and intensity that requires mental involvement. These maps were overlain with the districts to determine which districts were rich in both legibility and complexity. 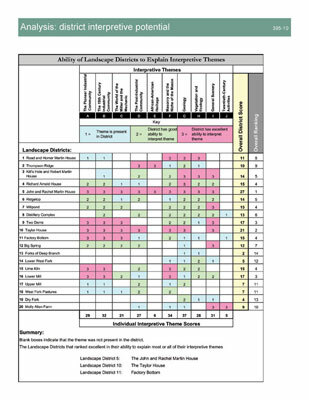 Interpretive opportunities for ten different themes were assessed for each district. The districts were then scored and ranked for interpretive strengths. Barriers to access included steep slopes, palisades, and creek crossings. Opportunities included overland routes that could circumvent crossings and additional access points through surrounding farm properties. Alternative schemes were evaluated to develop an access plan that provided the richest and most historically authentic experience with least environmental and financial cost. Specific management recommendations were made in each district for biological protection, cultural resource treatments, and access and interpretation. This map summarizes the major recommendations for the entire study area. Trails have been created to connect historic roads into choreographed sequences according to the plans for interpretive clusters. Visitors are currently taken on guided tours; in the future some areas will be open for unguided visits with interpretive technologies allowing individual pacing. One of the highest priorities in the plan is the acquisition and protection of land areas with important threatened resources or which have the best ability to communicate interpretive themes. Implementation is proceeding in all aspects of the plan including restoration of the Martin House and homestead, repair of rock fences, trail development, land acquisition, negotiation of conservation easements, eradication of invasive plant species, biological monitoring, and fencing.